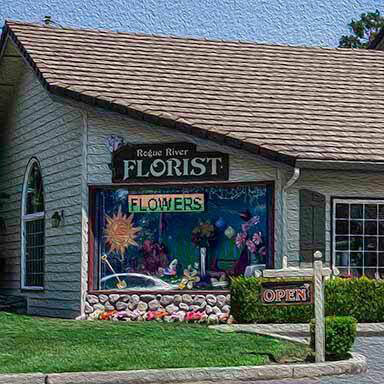 Rogue River Florist is happy to arrange delivery to local residences, most rural residences (additional delivery charge may be assessed), businesses, schools, hospitals and health centers, churches, and other venues in the Grants Pass area and surrounding communities. Please note that this list is not set in stone, and you can always call us if you have questions regarding delivery to your preferred location. We will be happy to accommodate you whenever possible! There is a local delivery charge of $10.00 per delivery within the city limits. Outlaying areas delivery price may vary. * Actual delivery charge may vary depending on location of delivery address within zip code. For deliveries outside our delivery area we charge a $22.00 delivery and wire fee. Orders received before 1pm PST can be delivered same day. If delivery is outside city limits or rural area, verification by phone will be made as we do not leave flowers at the door if no one is at home. We will try to accommodate morning or afternoon delivery. Timed deliveries are available for an additional charge except during major holidays. Deliveries are made Monday through Saturday during our regular business hours. All major credit cards are accepted. International orders must be called into our shop. To help guarantee your delivery we would appreciate having your order one day prior to holiday. Rogue River Florist will be closed on New Years Day, Easter, Memorial Day, Independence Day, Labor Day, Thanksgiving and Christmas Day. To better assure your holiday or any other day delivery having a home, work and/or cell phone number of the recipient will help with delivery.